Have you seen the movie, “The 100 Foot Journey”, yet? What a joyous celebration of food and the creative spirit. When I read the book 2 years ago, I had no idea that it would ever be made into a movie, and I am so glad that it was. I know that all of you, my foodie friends, will be thoroughly enchanted by it. There is a line in the movie that really struck home. It is something akin to “Food is memory”. I have been pondering this line since I saw the movie and I really think that this is the reason that many of us blog, don’t you think? I don’t think we should ever underestimate the power that food has to mark events and make meaning in our lives. I first started to remember today’s recipe after reading Saucy Gander’s post about a Pomelo Salad that she had eaten while travelling in Myanmar. Memories of my husband and I in a little beach resort in Mune Beach, Vietnam came flooding back to me: memories of a seaside lunch that included a vibrant salad very similar to this one, accompanied by a freshly, grilled fish. Maybe some of the ingredients were slightly different, but the flavours and the intention of it were the same. Then while browsing through The Flavour Principle, by Lucy Waverman and Beppi Corsariol, I found this recipe and my memory told me that these were the flavours that I had experienced in that idyllic little corner of Vietnam. The original recipe called for watercress, but for the love of money, I could not find a single sprig of it in any of the veggie markets in my neighbourhood. Here is my version of it, as I was guided by my memory. I hope you all enjoy it. I am very excited to bring a big bowl of this salad over to Angie’s Fiesta Friday! I know that after all of the lovely sweets that we normally indulge in at our favourite virtual party, we will all enjoy something on the lighter side. So, if you haven’t joined us yet at Fiesta Friday, please do. Angie at The Novice Gardener and her gracious co-hosts, put on an awesome bash every Friday and we just love new visitors! Come join us! Combine the ingredients for the dressing in a small bowl and chill until needed. Toss the ingredients for the salad in a medium salad bowl. Toss with the dressing and enjoy the exotic taste of Vietnam! This is lovely next to some grilled fish. Another wonderful salad! Thank you Julianna! I’ve really been wanting to see the movie! Looks great! And your salad looks lovely…as your food always does Julianna! Hugs! Oooh, I can taste all the varieties of herbs and a punch from the grapefruit. Exotic dressing too! A summer delight! I am off to watch that movie tomorrow with my girl friends :). The make character is one of my favorite actors from India. Very seasoned. That salad has amazing dressing. I bet juicy and scrumptious salad. Saw that movie last night with my girl friends. I could see myself living that movie….not as in restauranteurs but in cultural mix of it… Bringing your own food to a different country and experiment ion and fusing and at the same time keeping it simple and authentic :). Your blog is simply looking amazing . . . and your photography has really become fantastic! I love to see how your site has grown! Also, what a delicious salad. !! 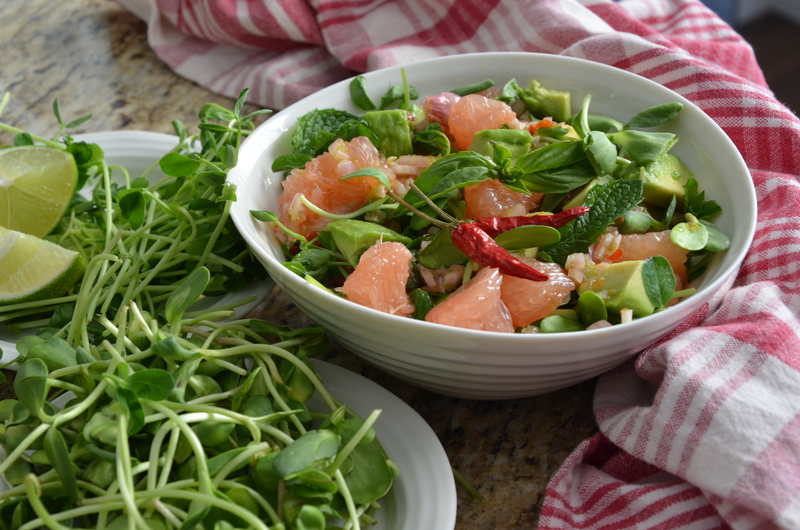 This salad looks so refreshing, and would be wonderful for a warm summer day! I havent seen the movie, gonna google it right after I post this comment 🙂 You are on a roll when it comes to gorgeous salads! This one looks so refreshing! So yummy Julianna! We’re having a quite hot weekend here in Montreal, this salad will suit perfectly the hot temperature! Thanks a lot for being at the FF! Beautiful salad, Julianna, and I am looking forward to watching the movie. I have been eagerly awaiting the chance to watch it. I think pea shoots are a nice replacement for the watercress. Hi Ngan! Let me know what you think of the movie when you get a chance to see it! Never tried grapefruit in salads. …This version of yours sounds amazing Julianna. ..
I’ve never heard of the book or movie but I love the line about food being memory. I totally agree that food can take you right back to some of the best and happiest moments shared with loved ones. Julianna, this looks so refreshing for summertime and so pretty to look at as well. I love these vietnamese flavours! 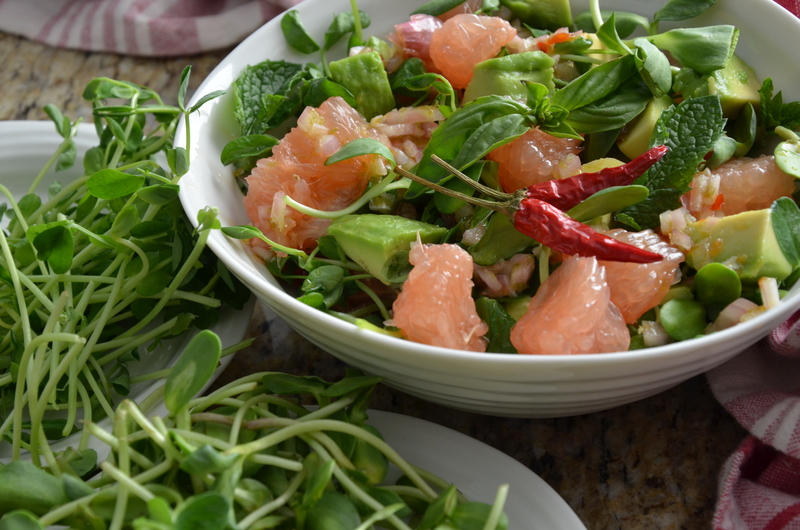 I had my very first grapefruit salad in Saigon several years ago. What a coincidence! Your post brought back such nice memories and now I’m wishing I had a bowl of your salad! I would like to watch this movie! This salad is so fresh!Delicious! Your salad sounds wonderful and so different. oh yes! i adore your salad! It’s so original! The salad is looking absolutely delicious! 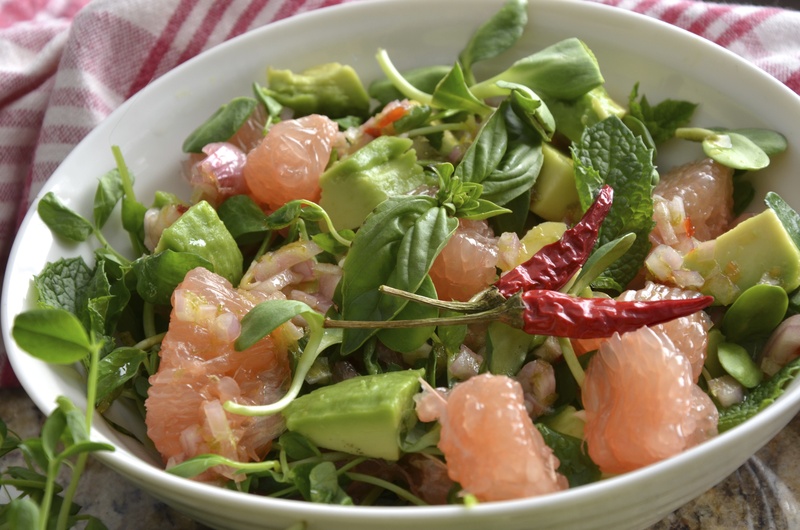 Grapefruit is a great flavour in salads! and the dressing sounds yummy! Thanks so much, Petra! I really love grapefruit! It adds so much freshness to dishes! Wow! That looks so fresh!